This spectacular pop-up book from paper engineers David Hawcock and Becca Zerkin forms the perfect guide to the world of AMC's The Walking Dead. Filled with eye-catchingly gory pops, the book takes the reader through some of the most iconic moments from the hugely popular series. 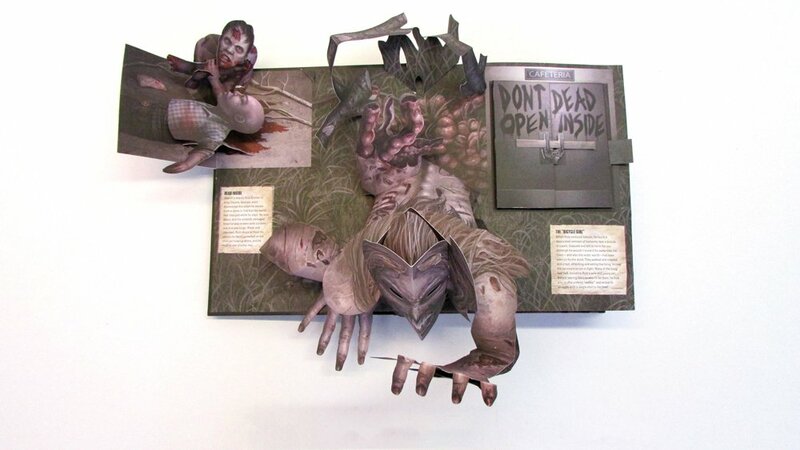 The book features five spreads, each with its own central pop that depicts a key element from the show, such as the prison where the survivors found refuge before being attacked by the Governor or the Walker known as "Bicycle Girl" reaching out at the reader. 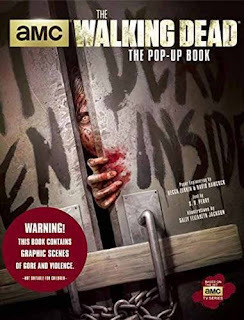 Each spread also includes several smaller pops depicting other memorable elements from The Walking Dead, such as the Governor's "man cave" (including his unique aquarium complete with severed heads), the Well Walker, and much, much more. I had a real problem writing a review of this book, as every time I picked it up I ended up playing with it. I can therefore guarantee that it will give any Waking Dead fan hours of fun. It's a huge book and resembles a ring binder in appearance which gives you some idea of the depth of detail in the 5 pop-up scenes. The first scene (Bicycle Girl) is shown below to give you an idea of the amazing paper engineering. As you can see, in addition to the huge 3D pop-up, there are flaps to lift and tabs to pull. Now you can see why it was so hard for me to put the book down and review it. I seem to find something new every time I open it; a flap I haven't lifted or a detail I didn't notice. I can't imagine I will ever get tired of looking at it - my favourite scene is The West Georgia Correctional Facility as the whole building does literally pop-up before your very eyes. The paper engineering really is second to none, and the detail in even the smaller pop-ups is quite awe-inspiring. It's a fabulous gift for any Walking Dead fan, or a gift for yourself if you can't bear to part with it. At £40 it's not cheap but it really is an absolutely breathtaking pop-up book for adults. I received this book from the publisher, PGUK, via Twitter in exchange for an honest review.